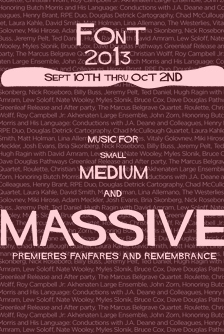 Festival of New Trumpet Music (FONT Music) presents Music for Small, Medium and Massive: Premieres, Fanfares and Remembrance, a marked exposition of sound for trumpet including commissions and tributes to friends old and new, premieres and fanfares, and music for 52 trumpets across two nights, September 10 & 11. Over the past decade, the Festival of New Trumpet Music (FONT Music), which as been praised as a “cross-stylistic extravaganza” by The New York Times, has presented some of New York City’s most exciting and adventurous music. On Wednesday, September 11, we premiere an Antiphonal Fanfare for six trumpets by John Zorn, celebrate the memory of Butch Morris with trumpeters and colleagues of Butch, and present the New York premiere of a Henry Brant’s antiphonal piece for 52 trumpets and percussion. The Festival of New Trumpet Music (FONT Music) supports new trumpet music in all forms, and provides a platform for emerging artists and creative pioneers. Its primary goal is to celebrate the excellence of the current music scene by hosting a broad array of new trumpet music performances. By presenting concerts throughout the year, commissioning new works, creating new projects, hosting panels, and collaborating with other New York presenters and international artists, FONT exposes the exciting range of current activity and brings together disparate communities of musicians, students, and audiences.